1. Our silicone breathable bands ONLY fit for Fitbit Charge 2. 2. Fitness Tracker and other accessories are NOT Included. 3. Don't clean the bands by soap, detergent or other chemical cleaner. ● Warranty: 30-Day money back, 18-month warranty for quality-related issues and lifetime friendly customer service. Small Size: 5.5-8.1 Inches /140-205mm. Large Size: 6.1-9.5 Inches /155-240mm. PREMIUM MATERIAL: Our Fitbit Charge 2 wristband is made of superior quality rubber, 3-line AIR HOLES, skin-friendly, soft and breathable; you can wear it at all hours of the day or night comfortably. If you work outside or like doing sports, it will be a nice choice for you for it can keep your wrist from sweating under the silicone. ADJUSTABLE LENGTH: [Small: 5.5''-8.1'' /140-205mm. Large: 6.1'' -9.5'' /155-240mm]. There are many precise holes on the strap, you just do not necessarily need put it in the traditional holes and can adjust the most comfortable size for you. You do not need to worry about the improper size. DOUBLE PROTECTION: A high quality stainless steel buckle, free from rust, will not fall off or become deformed; the silicone fastener ring/keeper is durable and soft, help to protect the band from coming loose and falling off effectively. 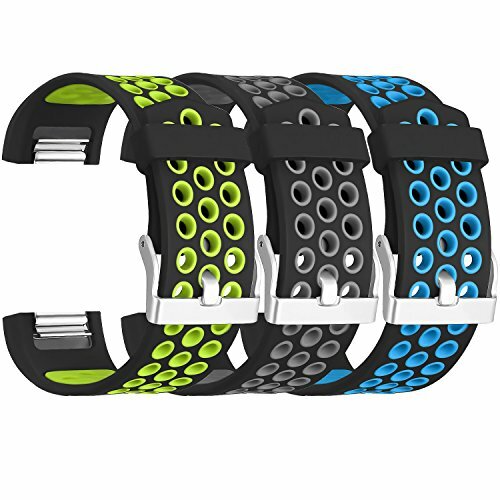 There is nothing to worry about when running, hiking, exercising, etc..
EASY TO INSTALL: High quality upgraded connector, it is very easy for you attach the bracelet to your Fitbit Charge 2, firmly, securely and safely, no tools are required, perfectly fit for your watch, give your watch a new and attractive look. CUSTOMER SERVICE: If there is any quality problem or something wrong with the color and size, please don't hesitate to contact SKYLET. We are happy to help you and will resend you a new one.